(Phys.org) —Major bridge failures in recent years have focused attention on the need to monitor America's highway bridges and other infrastructure. As thousands of bridges, parking garages and other structures age, improved methods for detecting deterioration could save lives and prevent economic disruption. Researchers at the Georgia Institute of Technology are developing a novel technology that would facilitate close monitoring of structures for strain, stress and early formation of cracks. Their approach uses wireless sensors that are low cost, require no power, can be implemented on tough yet flexible polymer substrates, and can identify structural problems at a very early stage. The only electronic component in the sensor is an inexpensive radio-frequency identification (RFID) chip. Moreover, these sensor designs can be inkjet-printed on various substrates, using methods that optimize them for operation at radio frequency. The result would be low-cost, weather-resistant devices that could be affixed by the thousands to various kinds of structures. "For many engineering structures, one of the most dangerous problems is the initiation of stress concentration and cracking, which is caused by overloading or inadequate design and can lead to collapse – as in the case of the I-35W bridge failure in Minneapolis in 2007," said Yang Wang, an assistant professor in the Georgia Tech School of Civil and Environmental Engineering. "Placing a 'smart skin' of sensors on structural members, especially on certain high-stress hot spots that have been pinpointed by structural analysis, could provide early notification of potential trouble." Wang is collaborating with a team that includes professor Manos M. Tentzeris of the School of Electrical and Computer Engineering, and Roberto Leon, a former Georgia Tech professor who recently moved to Virginia Tech. The work is supported by the Federal Highway Administration. This research was recently reported in IEEE Antennas and Wireless Propagation Letters, Volume 11, 2012, and International Journal of Smart and Nano Materials, Volume 2, 2011. Parts of this research were also presented at ASME 2012 Conference on Smart Materials, Adaptive Structures and Intelligent Systems (SMASIS) and several other conferences. The Georgia Tech research team is focusing on wireless sensor designs that are passive, which means they need no power source. Instead, these devices respond to radio-frequency signals sent from a central reader or hub. One such reader can interrogate multiple sensors, querying them on their status at frequent intervals. 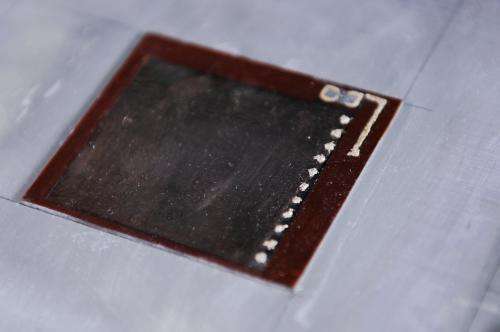 The researchers' approach utilizes a small antenna mounted on a substrate and tuned to a specific radio frequency. This technique enables the antenna itself to function as a stress sensor. As long as the structural member to which the antenna/sensor is affixed remains entirely stable, its frequency stays the same. But even a slight deformation in the structure also deforms the antenna and alters its frequency response. The reader can detect that change at once, initiating a warning months or years before an actual collapse. "A key benefit of this technology is that it's completely wireless," Wang said. "It doesn't require a battery, and you don't have to climb around on bridges running long connecting cables." The research team has developed a prototype strain/crack sensor that has been successfully tested in the laboratory, Wang said. The simple device consists of a small piece of copper mounted on a polymer substrate, plus a 10-cent 1mm by 1mm RFID chip. The chip is used to distinguish each individual sensing unit from others. The simple sensor architecture allows it to be made at very low cost and to potentially be deployed in large quantities on any bridge. More sophisticated designs are in the works. Tentzeris' team is tackling an approach that produces strain sensors using different applications of inkjet printing technology. One such design uses a silver-nanoparticle-based ink that is applied to a flexible or semi-flexible substrate, said Rushi Vyas, a Ph.D. student working with Tentzeris. The ink lays down a structure that can change properties in response to strain. 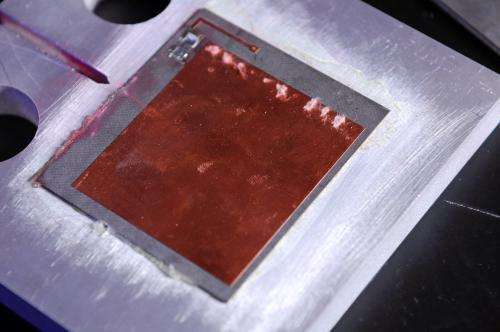 A second approach involves the use of inkjet-printed carbon-nanotube-based structures, Vyas said. In this case, the nanotubes themselves produce an altered response when subjected to deformation. 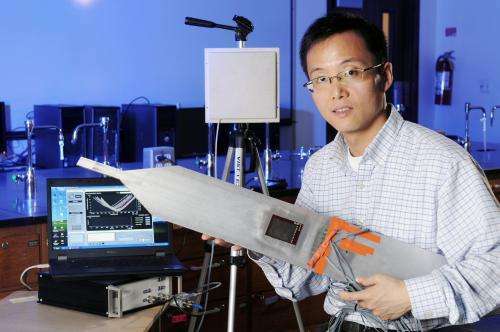 In laboratory testing, the team's prototype sensors have demonstrated high sensitivity in response to even slight changes in metal structures, Wang said. The sensors have been able to reliably detect a degree of deformation change as low as tens of microstrains (one microstrain equals 0.0001 percent, or 1 part per million), and they can continuously monitor stress accumulation until the metal develops a severe crack. One issue still being addressed is the capacity of the passive sensor to respond to a reader. A reader transmits a radio-frequency beam to a sensor, which utilizes that received energy to reflect a signal back to the reader. But this technique can be rather inefficient, Vyas said. A signal from a reader might travel 50 feet, yet the sensor's response might only travel back 10 feet. One issue is that readers are limited by FCC regulations, which govern how much power can be transmitted to the sensor. What's needed are ways to supply a sensor with a power source that would increase the range of the response signal. Batteries are not preferred because they can be undependable and require periodic replacement. One candidate solution – in addition to solar-energy and vibration-energy harvesting – is scavenged energy, Tentzeris said. A Georgia Tech team that includes Tentzeris and Vyas is researching ways to gather power from ambient or electromagnetic energy in the air, such as television, radio, radar or other manmade signals found in Earth's lower atmosphere. Scavenging experiments utilizing TV bands have already yielded power amounting to hundreds of microwatts. Multi-band systems are expected to generate one milliwatt or more – enough to operate some small electronic devices such as low-power wireless sensors. Tentzeris noted that smart-skin technology may soon help to enable a broad range of applications. These could include not only real-time stress monitoring in bridges, factories and buildings, but also new and extremely lightweight aircraft with self-sensing/self-diagnostic capabilities, and battery-free methods for monitoring structures after major disasters such as earthquakes or hurricanes. "The wireless strain sensor could prove to be an effective, low-cost and easy-to-scale solution to a very important need," Tentzeris said. "A simple device – consisting of an antenna, an inexpensive RFID chip and some power-boosting technology – could quietly monitor at-risk structures for many years, and then send back a real-time warning if there's suddenly a problem."